The "Lyt" is a small and neat, well performing light. and the lowest cost option in Busch & Müller's range. 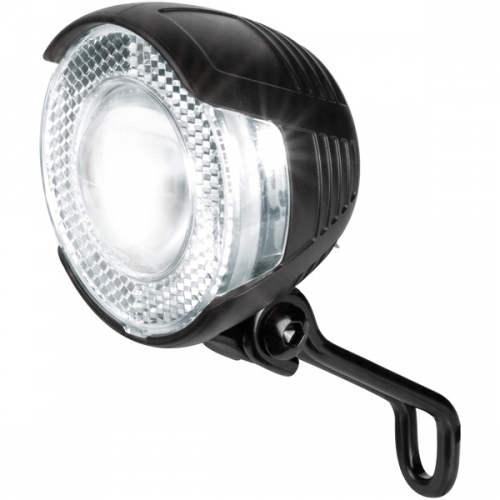 The 20 lux output (this is a revised version: older Lyts had a 15 lux output) is enough to outshine any older halogen front light, as well as some cheaper LED front lights. The inbuilt reflector gives passive safety, and this light includes a steel support for mounting on the fork crown. For use with a bottle dynamo order the B version without a switch. For use with a hub dynamo, order BN which comes with a switch. The B and BN have no "standlight". In other words, this light goes off when you stop, it doesn't remain on at a lower level as do many of our other dynamo lights. See also our other dynamo lighting options.